Reviews to see what's new! Hey there! Thanks for dropping by Harbingers! Take a look around and grab the RSS feed to stay updated. See you around! 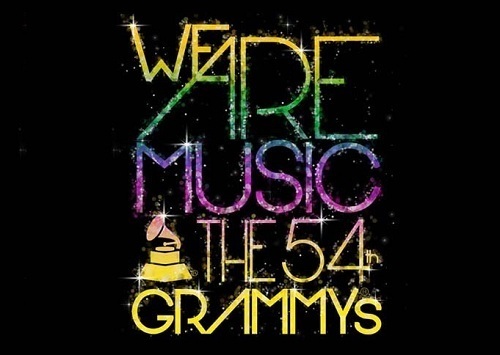 It is hard to sit through an entire award show, except for relevant performances, but this year the Grammy’s have given the ceremony a very consistent line-up that had you stuck on your seat. Opening with a prayer in honor of the late Whitney Houston, as everyone in the building bowed their heads, the show went on with show-stopping performances, mild tributes and shout-outs to Whitney throughout. It was overall a very gripping event. Adele, Katy Perry, Foo Fighters, Bruno Mars, Paul McCartney, Rihanna, Coldplay, The Band Perry, Jennifer Hudson, Blake Shelton, The Beach Boys themselves, and many more all under one roof, was definitely a moment to remember. As it was predicted, and pretty much a given, Adele swept the entire night nabbing the six Grammy’s she was nominated for (including Album of The Year), and deservedly so. The Foo Fighters were not too far off, taking a total of five for Best Long Form Video, Best Rock performance, Best Hard Rock/Metal performance, Best Rock Song, and Best Rock album respectively. Kanye West followed with four, and Skrillex with three. The flawless Bon Iver scored their first two Grammys for Best New Artist and Best Alternative Album; even Chris Brown won one for Best R&B album (Odd, since F.A.M.E. is predominantly filled with dance cuts). 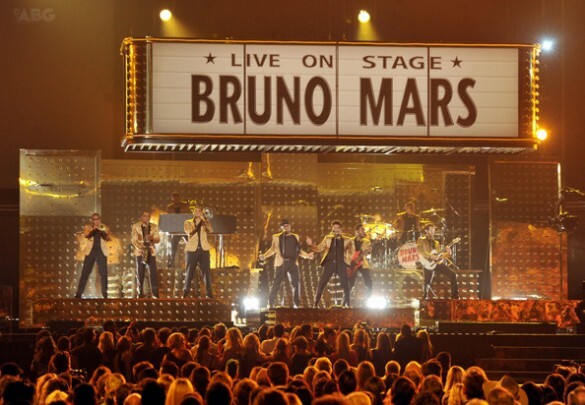 Bruno Mars brought the house down with ‘Runaway Baby’. With an old fashioned lit marquis and all, Mars shut it down with his vocals and stage presence. Alicia Keys and Bonnie Reitt performed in honor of the late Etta James, along piano keys and acoustic guitar; their voices matched perfectly. ‘Don’t You Wanna Stay’ was impeccably sung on behalf of Jason Aldean and Kelly Clarkson, who took in Aldean’s line when his microphone went off; beautiful duet. Chris Brown busted a move for a medley of ‘Turn Up The Music’ and ‘Beautiful People’, it was a gymnastics spectacle but nothing too impressive; usual Brown. The Foo Fighters proved rock is not dead with ‘Walk’; felt like 1990 all of a sudden. Rihanna reworked the introduction to her smash ‘We Found Love’ and struggled to keep her pitch, she ultimately could (with help of a backing track), and for once, showed energy on the stage dancing alongside a dance troupe. 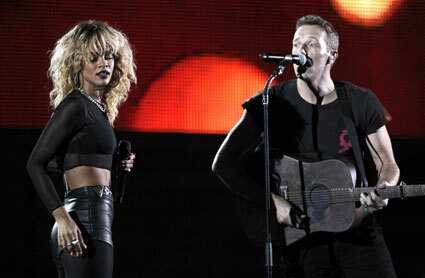 She later joined Chris Martin for an acoustic performance of ‘Princess of China’; Rihanna outdid Martin, as he sounded like a howling/dying animal. ‘Paradise’ was no different, Martin’s vocals sounded exhausted; the stage set-up was brilliant though. The night went on in a cute note with Taylor Swift, who performed ‘Mean’ and seemed genuinely humbled by the standing ovation she received at the end of her number. This girl has come a long way, it was amazing to see her remaining so down to earth, at an event of this magnitude. Ironic how Katy Perry alluded to her wedding, and dedicated her performance to all the lovers in last year’s ceremony, just to now slam Russell Brand on the face. She misleadingly initiated ‘E.T.’, before a sound intermission allowed a rapid costume change, so she could deliver the bruised opening lines of ‘Part Of Me’, ensued by the pulsating riffs of the song, while she descended on stage (‘Part Of Me’ precedes her album re-release). Katy looked triumphant up there in a warrior-esque latex ensemble, breaking glass, spinning on her feet, and melting ice sculptures. She tore that stage, build it up again, just to bring it down on fire. It was a powerful performance, very heart-felt and filled with passion; it must’ve been cathartic and therapeutic all at once for Perry. It was major; standing O.
Maroon 5 and Foster The People honored the legendary Beach Boys; it is worth mentioned the lead vocalist of the latter band, seemed awkward the entire time. The Beach Boys, after years of silence, still got it. 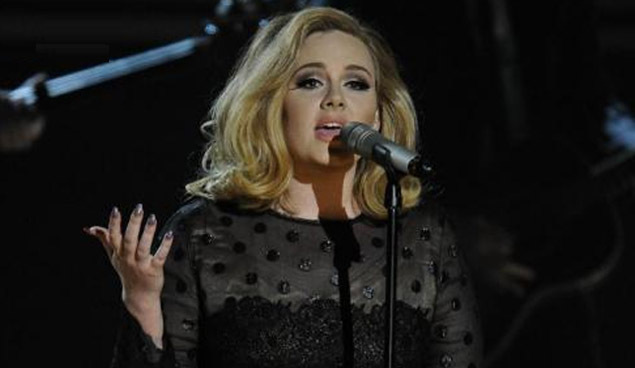 Adele returned to the stage to grace everyone with ‘Rolling In The Deep’. Post having surgery and sounding like this, only Adele could; she was on perfect key. 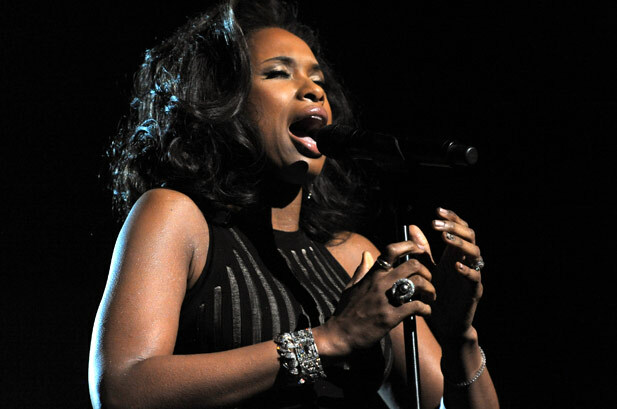 Jennifer Hudson was given the honor of farewelling Whitney with her trademark ‘I Will Always Love You’; she was breathtaking, but kept her full range on low key. Despite the outstanding performances on behalf of the aforementioned, there was Nicki Minaj, making her best Lady GaGa impersonation, as she ‘exorcised’ herself in a horrendous rap beat, that was more yelling and ridiculous eye popping than anything else. The religious allusions were unnecessary and offensive. The show could’ve done without. In what was another mess, was the mash up of David Guetta, Dead Mouse, Lil Wayne and Chris Brown performing ‘Rope’. All the strobe light, neon and mind numbing beats were out of place. In its whole, the Grammy’s outdid themselves for once. And kudos for putting something up for Whitney Houston on short notice. Below, a list of this year’s Grammy’s winners. Best R&B Album: Chris Brown – F.A.M.E. With ‘Mine’ doing well in the charts at the moment, Taylor Swift has revealed the official album cover to her upcoming release, Speak Now. It looks as clichéd and as corny as her music has been to this day, as well as the album title. Swift used to be somewhat of a country-pop singer, but now not only her music but also her image are going all pop. She looks overtly photo shopped; it blatantly tries to channel what Katy Perry did with the cover for Teenage Dream. Perry’s cover being an actual painting, Swift’s cover appears to be a cross between both a shot and painting effects; it miserably fails and turns out tasteless and unoriginal, cheap and most commercial. Speak Now hits stores October 25th. Taylor Swift is set to release her third album, Speak Now, October 25th. ‘Mine’ serves as the first single off the new record, and upon first listen, it is nothing new nor a heightened musical accomplishment from what she has already done. Swift’s vocals are still weak and both her sound and delivery show no distinction from her past work. 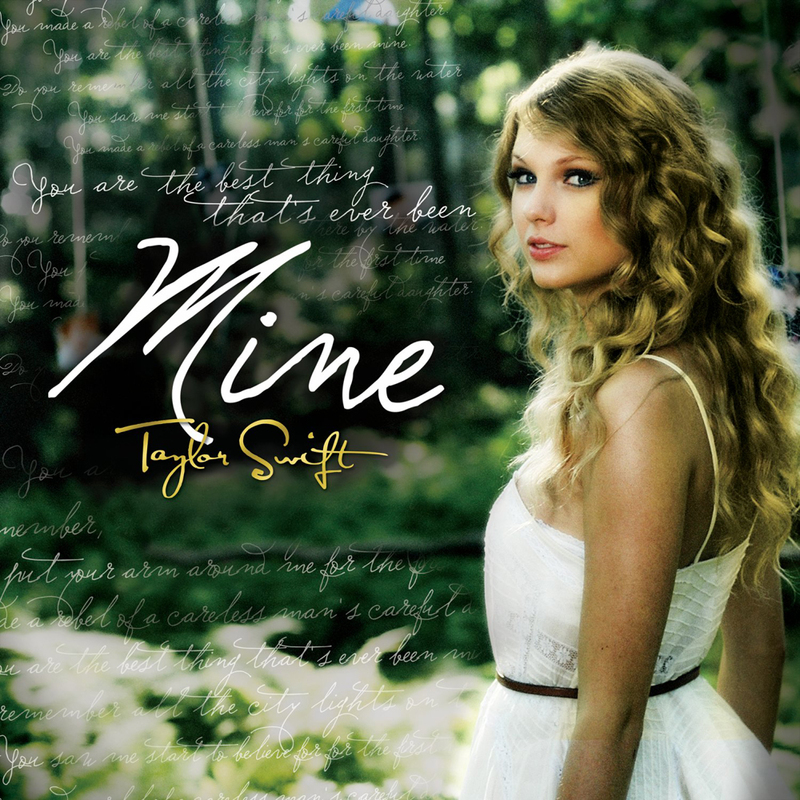 ‘Mine’ could easily mesh well in either her debut or Fearless as an album cut or a bonus track. It is well written accompanied with a beautiful melody. It has a catchy chorus and will play on heavy rotation on radio, and might become yet another hit for Swift, but in reality, it is just another country-pop number, which slides more into pop than country, and still follows the exact same structure of her previous singles. The lyrics are quite resourceful and a little less juvenile, with the only difference of instead addressing high school, they now introduce a ‘college’ insinuation, leaving behind all worn references to fairytales, castles and prince charming. It was entirely written by Taylor Swift while production was handed over to Nathan Chapman. According to Swift, this track is inspired by her ‘tendency to run from love’ but finding an exception; it is a no-nonsense description of a relationship unlike her past love-related songs. ‘Mine’ is a nice listen, but it is nothing one has not already heard from Swift. Click to subscribe to Harbingers and receive notifications of the lastest news!